At coffeeshops around the Bay Area, caffeine fiends seek solace in the one-cup-at-a-time specialty coffee of Philz Coffee, knowing nothing of the historical dispute hidden in their cups. Inside the first “Philz Coffee” at 24th and Folsom streets, Phil Jaber, a man who has gone from owning a corner store to being backed by some $15 million in VC funding sits at the head of a wooden dining table, the overseer of 18 locations in the Bay Area who plans to soon expand nationwide. But on the other side of the Mission, one coffee competitor says that the idea for the “one-cup-at-a-time” brewing method sprouted on his terrain. “I taught Phil how to do it,” said Rodger Bories, a wholesale coffee distributor who said that Jaber was his client from 2003 to 2008. “I had the concept, and he wanted it. So, I gave it to him,” he said, adding that it was an exchange for which he never received due credit. In that Bories would not disagree. Bories opened his first coffee shop in 2009, and now runs “Rodger’s” Quick Drip Coffee and Tea, a small, inconspicuous coffee shop at 20th and San Carlos streets. On some days he displays a banner outside naming the cafe the first “one-cup-at-a-time” brewer. It’s not appropriation if you have the idea first, explained Bories. Lacking the volume of customers that Philz has, Bories recently lowered his prices in the hopes of attracting more business. Inside, customers are invited to place their orders while standing at a coffee bar similar to those found in Philz stores, where they then witness the pour-over process. Over 30 coffee flavors with names like “Gold Rush” and “Jet Fuel” are available for tasting, and all are Bories’ unique blends. Bories broke into the coffee trade in 1982, when he developed a custom designed “quarter pound bulk dispenser” that he sourced to local supermarkets, responding to a need in supermarkets for accurately measuring bulk coffee beans for sale. 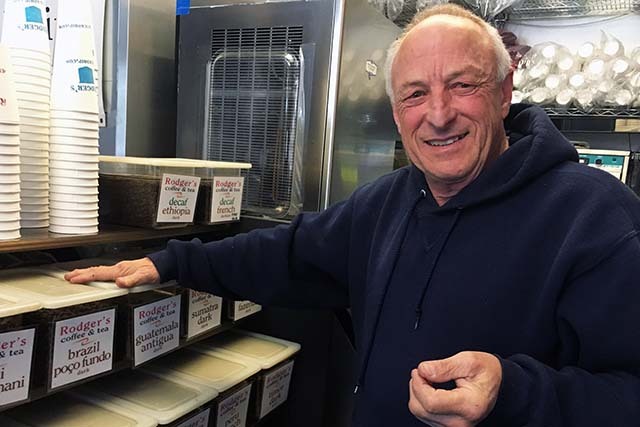 He dubbed the portioned coffee bean dispenser and his coffee bean blends “Coffee Magic,” and said they were “a big hit” in some 65 local supermarkets to which he distributed. But when a corporation tapped into the local market, Bories said he lost half of his clients in a matter of months. “Nestle came in with a lot of money, and like a good football team, they scattered the small players,” said Bories. Then, in 2000, Bories was diagnosed with cancer. Despite firmly believing in his product, he said, he found himself “at the bottom” as he searched for innovative ways to keep his wholesale business intact and provide for his family. Bories began tinkering with his brewing equipment, and eventually created a modified brewing basket, which he dubbed “Quick Drip.” With slanted walls, Bories said he figured out how to keep coffee grounds out of receding water, while “flooding” and stirring the grounds in the brewing basket cut down on brewing time, compared to other conventional drip coffee methods. Bories’ pour-over brews quickly captured the tastebuds of a local businessman, he said, who expressed interest in the concept. Bories recounts walking into Jaber’s liquor store in 2002. Bories said he took on Jaber as his customer, but went beyond supplying him with coffee beans. The two formed a working relationship in which Bories said he helped turn the liquor store into a coffeeshop based on the one-cup-at-a-time concept for which Jaber is now famous. “He talked me into giving him a box [coffee station], where he started making the coffee as I showed him how to make it [with the drip method],” he said. Bories said that he saw his collaboration as a chance to revive his own wholesale business even as he underwent treatment for sarcoma. But Jaber said that he built his own stations that allowed him to pour cups individually. 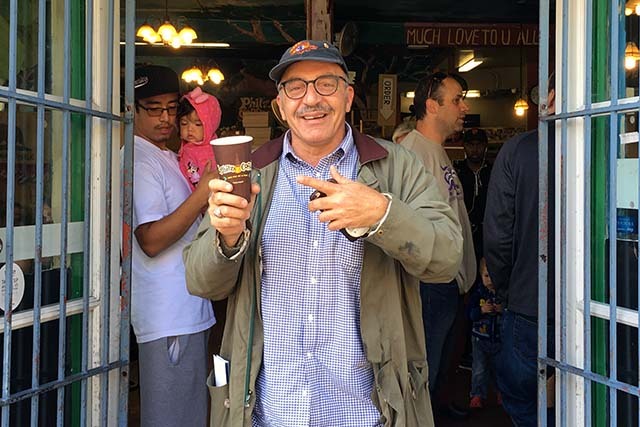 But after working together for five years and with Philz’ mounting success, the relationship turned sour, said Bories. Jaber confirmed that he and Bories worked together “for a minute,” but did not divulge details about the split. According to Bories, the breaking point came when Jaber dropped him as his distributor, but refused to return the brewing equipment. But Bories said he has buried the hatchet and congratulates Jaber on his success. Jaber has also moved on. Squinting through thick-rimmed glasses, he double taps on a cell phone picture that places him at Facebook’s Mark Zuckerberg’s wedding. “You know who that is?” he asks gloatingly, pausing mid-scroll on another photo that shows the 60-year-old in a chummy shoulder hug with San Francisco Mayor Ed Lee. I used to get one cup coffee in Santa Cruz years before this. I really enjoy Phiz coffee, but Phil himself is an arrogant, egotistical, misogynist. His son, Jacob, is awesome, so as long as you don’t need to deal with Phil himself (or you’re dealing with him as a male) you’re fine. Also, I heard he ‘stole the idea’ of adding cardamom in his coffee from one of his former family members. I don’t really care who invented the idea, but it seems like there’s a bit of a pattern of him taking credit for other people’s ideas. I’m pretty certain that it was probably a person camping/living by themselves that did it first and well over a hundred years ago. I lived on the coast in El Granada in 1992 and the man who ran the hardware store near the beach sold delicious one-cup-at-a-time coffee. He had a setup of 3 or 4 coffee cones fixed to a long board so he could serve multiple people at a time. It was the best coffee in town–I loved going to the hardware store to buy my coffee! Santa Cruz roasting company has been brewing individual cups of coffee for 30 years, at least since 1986, if not earlier. Neither one of them can get the credit for “inventing” this idea.